Here are some really easy BBQ dips that make a delicious appetizer or accompaniment to any barbecue cookout. Use them to give your guests something to nibble on while the main food is cooking and you can rest easy in the knowledge that they're not going to fill themselves up. To be fair you don't have to reserve these for the barbecue. Depending on how many people you're cooking for you can ether go for little ramekin dishes or larger bowls if necessary. If it's just a small crowd then sometimes it's good to use the ramekins and give everyone an individual dip. When it comes to dipping in, there's a multitude of thinks you can use right through from bread sticks to vegetable crudités. Just cut up celery, carrot and cucumber into long thin strips and dip away. I don't stand on ceremony, I just pop the crudités into a bowl or a glass and keep it simple. Most of the BBQ dips are really easy to do and can be knocked up in a matter of minutes and when you compare them to any shop bought dip then you'll really notice the difference. When you look at the links below it seems to be the Greeks and the Mexicans that are big on the dips. 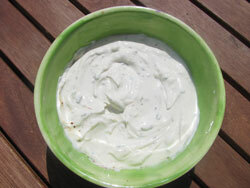 Tzaziki - cucumber, garlic, olive oil and yogurt. As well as using it as a dip, this is a great accompaniment to a kebab (kabob). Guacamole - avocado based and there's a few extra ingredients you can add to put your personal stamp on it. Hummus - mashed chick peas with added tahini. Lovely. 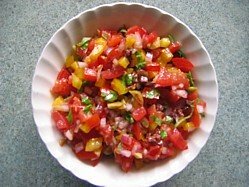 Salsa - I add this to all of my wraps! Green Chili Relish - if you like a bit of spice then this one is for you. Cucumber Raita - Indian Yogurt Cooler - mildly spiced this is the perfect way to take the edge of any hot dish. Sour Cream And Chive Dip Recipe - easy to make and such a great flavor combination. Smoked Mackerel Dip - you can prepare this one right from scratch. 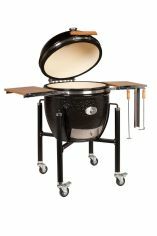 Brining, drying and smoking your fish before finally preparing the dip. Don't feel that you have to reserve these recipes exclusively for dips though. Many of these dishes in their native countries would be used as accompaniments to the main courses so feel free to use them accordingly. You'll find in many of my Greek menu ideas that Tzaziki is always there at the end to complement the offering for example.